Home brewed For the Little Woman enjoyed on the patio. Tasting day for For the Little Woman. Home brewed almost two months ago, this beer is ready for an official write-up. The brew day was rather simple as there was a smallish grain bill and minimal hop additions. There were no special steps. All-in-all nothing to worry about. Handling of the beer was simple as well. Chill, add yeast, temperature control, and let he yeast feast. No extra additions of any kind. Bottling was straight forward as also. No hop trub to cloud the beer or back up bottling gear. Just add to a sanitized bucket on top of the priming sugar liquid. After I put my brain through the paces, I turn to the cost of brewing this beer to purchasing a similar craft beer. In this case, since it is inspired by Spotted Cow, it is an easy comparison. Spotted Cos is ~$9.00 a six pack, $36.00 a case, which amounts to $72.00+ for the amount of beer I brewed for this batch at retail cost. This beer cost me just under $20 in material cost to brew. Yes, my time is worth money, but it is a hobby. Therefore, if this thing tastes good, it is always the easier winner. Look:Light gold, leaning towards straw. Hazy. Minimal white foam that is quick to leave doubt it ever existed. No lacing as expected from the initaial foam. Aroma: Straight corn sweetness. Brings back distant memories of creamed corn that was highlighted the dinner table so often as a child. Light grains. Taste: Follows the nose. Predominately corn sweetness. No sign of hops. Body: Light body. Light/Medium carbonation. Surprisingly dry. Crisp. Overall: A nice, light beer. Simple, one noted. Easy to drink. Somewhat lager like. See why so many people find this a cross over beer. This beer did remind me of Spotted Cow but is definitely not a clone. Very similar with the inspiration coming through. I think there is a need for a few (3 – 5) IBUs to be added for more balance in the finish. Enjoy! Useless Fact: Astronauts on the International Space Station exercise about 2 hours per day. For the Little Woman is a home brewed beer with a ton of inspiration from Spotted Cow, by New Glarus Brewing Company; one of my wife’s, Little Woman, favorite craft beers. 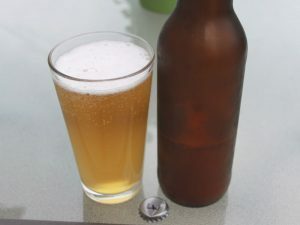 I home brew two other beers that are mainly hers: Grass Cutter and Honey Pale Ale, but For the Little Woman is the first that was inspired by an actual craft beer. Base malt, cara-pils, and S-05 yeast are always on hand. Some of the recipes also called for flaked barley. I decided to drop that for a bit more flaked corn. The only concern I have for 12.0 ounces of flaked corn: too much corn, yielding an almost popped corn and/or corn cereal flavor/aroma. The total of the flaked corn used in this recipe was less than any total of flaked corn and barley combined as well as, there were a couple of recipes approaching this much flaked corn as well. Still concerned. It will be a simple fix if the corn is too strong: use less corn. This is a rather simple beer to brew based on my recipe formulation. Using a single ounce of hops in a beer is something I rarely do and brings back memories of when I was brewing many wild/sour beers. 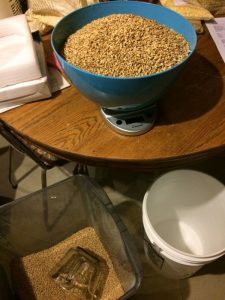 This was one of the most successful/easy days of home brewing I have had in quite some time. Gravity readings were higher than expected. I think I finally have the grain mill dialed in. Thanks to Fred Francis, at monster mill, for his patience with his assistance. Rich joined in to make the time pass quickly as our conversation centered on craft beer, home brewing, and anything similar. Enjoy! 2017-02-20: @63.5*F, moderate fermentation, placed on heat blanket set at 68.0*F.
2017-03-05: Bottled with 3.5 ounces of priming sugar and 2.0 cups of water. 25, 22 ounce bottles. Bottle crown label: LW. Useless Fact: Farts have been clocked at a speed of 10 feet per second (7 mph).